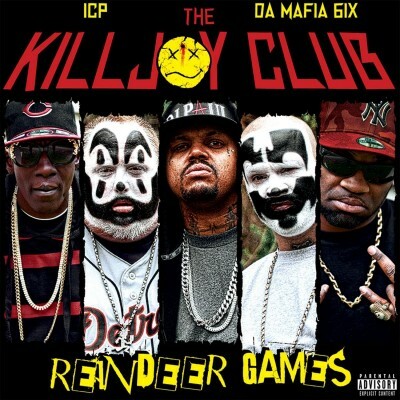 News > Psychopathic News > The Killjoy Club “Reindeer Games” tracklist announced! The Killjoy Club “Reindeer Games” tracklist announced! Reindeer Games will be available for pre-order next Tuesday, August 19th on hatchetgear.com! Looks pretty decent. Really cant wait to hear that BH collab and the Boondox collab. Panic Mode ft. Otis was sick as hell. so the panic mode they released didnt have otis on it? I think Otis is not a “guest” because he’s a part of Killjoy Club. Violent J said he is almost on every track. The 1st the news broke of this I was skeptical but then after I heard Panic Mode…Like Whoa!!! im pretty geeked for this. cant wait to hear the tracks wit Hoodoo and Boondox. Album cover looks kinda whack tho. but im over it! Otis prolly fucked up Joe’s waffle house order and got kicked out the group!